Chest Herbal Supplement for Dogs | Elk Velvet Antler | Wapiti Labs, Inc. 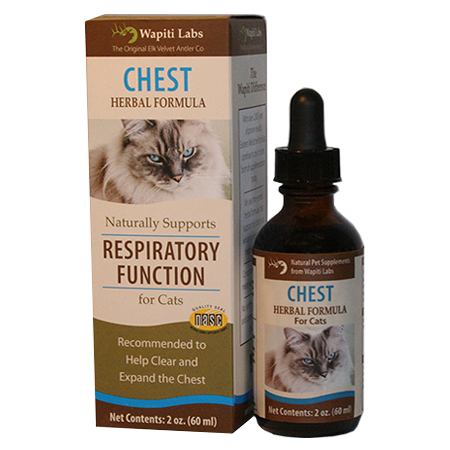 This concentrated liquid supplement is formulated with natural herbal ingredients to help support normal respiratory function and health. Available as a concentrated liquid formula. No synthetic ingredients are used in this supplement. We use a proprietary processing method. Made in the U.S.A.
My dog has suffered from a cough for years. After trying this product he sounds so much better and I feel better giving him something natural. This potion really helps dogs with bad coughs and who have KC. I highly recommend this product especially in the case where you don’t want to use anything too harsh.